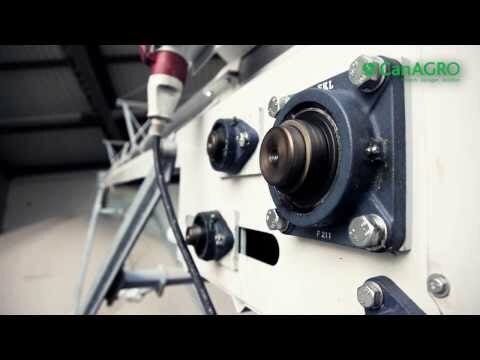 Tube belt conveyor as an alternative to the grain screw conveyor? Stack higher.Careful conveyingLong longevity. Tube belt conveyor have a varied range of applications. A conveyor belt running in a tube combines the benefits of screw conveyor and belt conveyor. Long longevity and running power due to few mechanical wear parts. For a conventional belt conveyor, a large number of rollers and ball bearings are used, for a grain screw conveyor the mechanical attrition is greater. The running powers until the belt is worn out amount up to 200,000 tonnes. The belt speed means that the conveyed goods are thrown out about 1-2 m over the output end. As such, the larger dumping height on storage is achieved. With a tube belt conveyor of approx. 13 m, up to 5 m is achieved - by comparison, a mobile CanAGRO screw conveyor of at least 18 m is required for this. With a tube diameter of 250 mm, outputs of up to 120 t/h are possible. Tube belt conveyors are supplied in galvanised design or alternatively with a stainless steel tube and can therefore also be used for transporting manure.